It’s written from the perspective of a product right at the start of its life — an idea waiting to be realised, and primarily for people inexperienced in building digital products. But it can be applied to any stage of a product’s life and is by no means a definitive approach. It’s a guide to help the novice in particular navigate getting their idea to functioning product in simple steps. These steps are intended to help deliver a successful product that is designed with users in mind. Testing is included in every step. It’s important to adapt the product in response to user feedback and keep refining until you are satisfied your product meets the needs of your users. It’s also very important to understand your users and target the right group. Make sure you spend time at the Hypothesis and Service stages in order to get that bit right. And if you build your prototype and then find it doesn’t work for users, go back to the beginning and try again. The first three steps are there to help you get it right, even if that means failing a few times in the process. It’s better to fail at that stage than after you’ve spent time and money writing lots of code. It’s important to take the time to develop a set of hypotheses. This is where you learn about the problems that need to be solved and work out what makes your solution unique compared to others. Even if you think you understand the problem from the start you should test that your theory is correct. You might find that your product changes as you learn more about the people who will benefit from it. [These people] [experience this problem] which results in [this outcome]. [These people] will want to use our product as it will provide [this improved outcome]. This is where you decide which tools and techniques you are going to use to solve the problem. You will identify all the different elements of the product and plan the flow that users will follow. It’s important to stay focused on your users/customers and plan the solution based on what you learned from them as you were developing the hypothesis. You should use the research you did during the hypothesis stage to decide which technology platforms to use. This is also a good time to start thinking about how you want the product to look and feel to users. Should it be formal and official or fun and playful? Start collecting examples of design and copy that illustrate the kind of feel you want for your product. 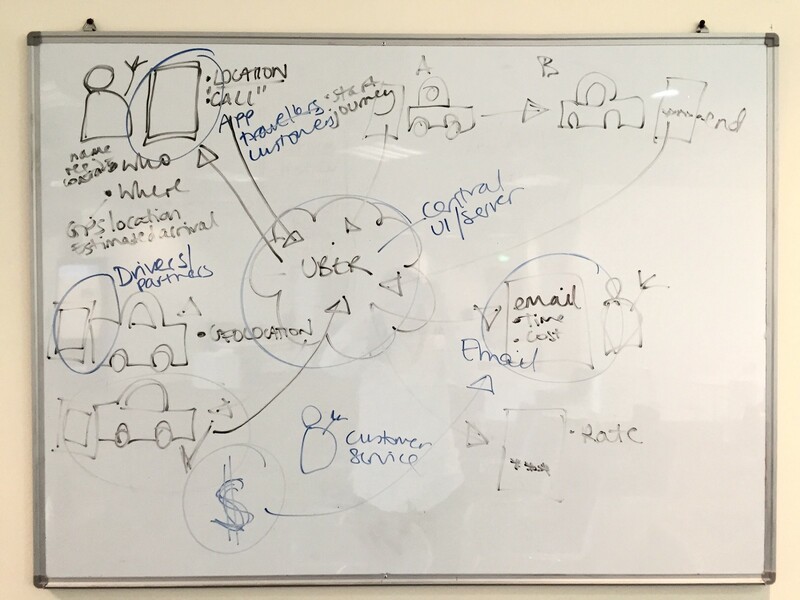 Make a diagram showing how Uber works trying to identify all the different elements that make up the experience for users, drivers and the back office processes. This isn’t about accuracy and don’t worry if it’s very rough, it’s trying to help you think about all the different elements that make up one product. Doing this exercise with your own product will help you identify the different elements that your product needs to function. Having a prototype will help you work out solutions for the user interface (UI) and gives you something tangible to test and show to investors. Keep it very simple — concentrate on core functionality (minimum viable) but keep a record of all the ideas you come up with that could be added in future. For hardware products some engineering will be required, but for software products no coding is needed. Your prototype could be a series of flat designs that form a sequence. Designs could be highly polished, or hand drawn wireframes. Alternatively it could be a video that shows how it works — the way Dropbox did it, or launch a website to test the idea first like how Buffer did it. This is where you launch your product to the world. Take what you have learned from the prototype and build the minimum viable version of your product. This is where you should start building robust and extendable code that will support new features and improvements. Keep a record of all your ideas for future development and don’t be afraid of saying ‘No’ to features that are unnecessary at this stage. You will want to use an agile project management technique such as Scrum or Kanban to focus your team on delivering the most important features of your product first. Prioritise the ideas in a product backlog and brief the team to work on the top priority items first. This means that you can focus on delivering the minimum viable version of your product knowing that other ideas and features can be added relatively quickly in the future. Nothing is forgotten, nothing is lost. But everything must be prioritized. Launching a product is just the beginning. There are many stages on the journey. Hopefully you will be working quickly towards a stable platform that is accepting revenue and supporting users. It is up to you when the BETA label is no longer required but typically it is when your fundamental platform is robust and you can set your sights on scaling rather than getting the basics in place. Arguably this is also where your journey begins. Getting to BETA and beyond does not mean your product backlog is empty. In fact it’s likely to keep growing. It’s best to work in software sprints, building, testing and getting feedback from users every step of the way. You may find that over time your product morphs into something quite different to how it started — as you get feedback from the people using it and respond to their requests. I hope you find this guide useful and that it helps make the product development process a bit less daunting.